The Dubliner fights this Saturday night at UFC 188. EVER SINCE HE made his Ultimate Fighting Championship debut last year in Dublin, Cathal Pendred has encountered his fair share of detractors. He may not possess the extravagant technique of his Straight Blast Gym team-mate Conor McGregor, but what he lacks in style, he makes up for with hard work and a never-say-die attitude. In spite of his critics, Pendred has remained undefeated so far in the octagon. Another victory this Saturday night — against Augusto Montano at UFC 188 in Mexico City — will take his UFC record to 4-0. Only Neil Magny has a longer current winning streak in the welterweight division. Pendred has invested a lot into doing so. When the fight with Montano was announced earlier this year, the UFC flew him to Mexico for media obligations. Not the most enjoyable aspect of being a professional athlete, but it turned out to be a blessing in disguise. While there, the Dubliner noticed the impact the altitude had on his breathing. His original plan was to travel to Mexico two weeks out from the fight, but Pendred soon realised that a fortnight wouldn’t suffice. “I did a bit of training while I was in Mexico for the media stuff and I found that, because of the altitude, I got hard of breathing sooner than I normally would during a session,” Pendred explained to The42. His plans subsequently changed. Pendred has been in the Mexican capital preparing for the fight for the past five weeks. SBG colleagues Gunnar Nelson, Chris Fields, Matt Inman, Peter Queally and Colin Meagher have also been there to lend a hand. Pendred has already spent most of what he’ll earn from this Saturday’s fight on relocating his training camp, but he describes it as an investment in his career. Although the 27-year-old has received a warm welcome in Mexico over the past few weeks, that will change on Saturday when he trades blows with a local favourite. Augusto Montano is aiming for a second UFC win, having been victorious via first-round TKO in his debut against Chris Heatherly back in November. Pendred believes “there’s not much substance” to Montano’s 15-1 record and he expects to finish his opponent inside the distance. Getting the nod from the judges in Montano’s hometown will be difficult, Pendred acknowledges. Fortune favoured the Irishman when his last bout against Sean Spencer went to a decision, but he’s determined to consign the controversy that followed the result to the past by winning in emphatic fashion this weekend. “My aim is to perform to my ability and get an impressive stoppage,” Pendred said. “If I do that I won’t have to worry about the judges. The plan is to steamroll this guy. A win this weekend puts me 4-0 in the UFC in less than a year with the company and that leaves me in a great position. “I haven’t shown anything close to my best in the UFC yet. I’m really focused on putting in a quality performance, I owe that to myself. I’ve worked very hard to get to the biggest stage in the world. Email “'I haven't shown anything close to my best in the UFC yet' - Pendred”. 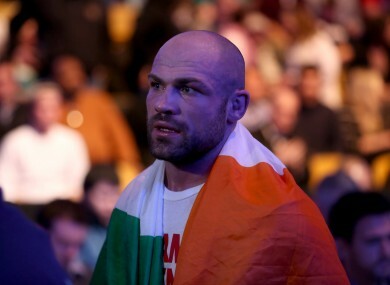 Feedback on “'I haven't shown anything close to my best in the UFC yet' - Pendred”.